January, arguably more than any month of the year, is when we are the most focused on ourselves. This can be a great thing: What are our goals? What are the changes we want to see in the coming year? How can we do better? It's pretty much "me" month, which makes this well-being guide perfectly timed, because self-care needs to find a place in January, because it is also the month we are hardest on ourselves. In recent years month-long commitments like "drynuary" or "veganuary" have become popular, with participants abstaining from certain food and drink and test driving new lifestyles and habits. It can be really important to take time to consider our relationships to things like alcohol or the environmental impact of the food we eat, but at the end of the day the reason that these trends gain particular traction in the new year is because January's brand is the purge and cleanse—the promise of washing away our December sins, a self-imposed penance for our holiday comforts. 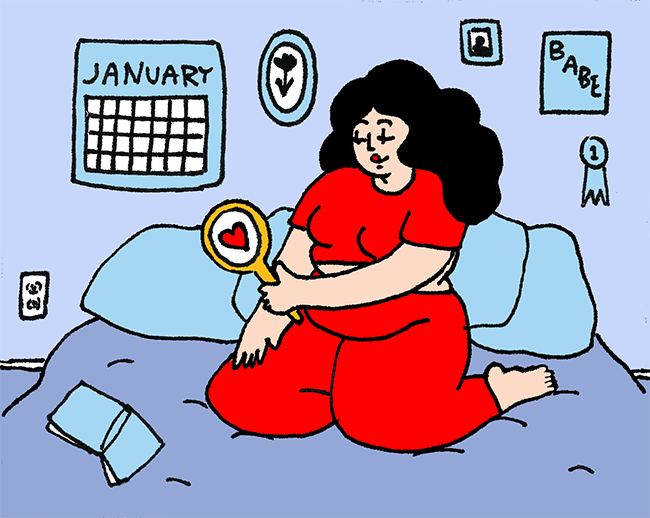 January is not a month where body positivity thrives. Everyone from the Kardashians to our coworkers is raving about some new diet, workout or trick for taming and shaming our bodies into submission so we can become brighter, shinier, thinner versions of ourselves. We gobble up these weight loss theories like they are the Christmas cookies from the month before and we once again enter into a cycle where we are at war with our bodies. And no disrespect meant to Barbara Kruger, but maybe our bodies don't always have to be battlegrounds. Maybe it is perfectly fine to say, "I'm not changing my body this year," or, ideally, "I like myself just the way I am." Sometimes at a time of year where change seems to be the only option all we need is permission to stay the same. Trying to stand still in diet culture's sea of skinny teas, juice cleanses, boot camps and "before and after" photos takes its own strength—the strength to resist the idea that your body is inherently flawed and needs to be corrected. The person in the "before" photo deserves every bit of kindness as the "after" photo does, and sometimes more so. Because it is way too often that our fattest and our heaviest bodies receive so much unkindness from the world. Maybe we'll be happier if we just get rid of "before and after" photos all together. So in the diet-centric weeks ahead, remember: Your body is not a problem to be solved. You don't have to be thinner to be healthier, you don't have to be toned to be strong and you don't have to change your body in order to love and take care of it. Cut yourself some slack, because 2019 looks great on you, just the way you are.